House and Senate lawmakers on Wednesday agreed to set aside $100 million to help finance the Kauai flood recovery effort and $25 million to speed the Oahu recovery, money that can be made available quickly until federal relief funding is available. The appropriation could be signed into law by Gov. David Ige as early as this week. Star-Advertiser. Hawaii legislators are rushing to send $100 million to rain-soaked Kauai and make $25 million available statewide for damage caused by last weekend’s deluge. Civil Beat. Hawaii lawmakers are appropriating $125 million to help with flood relief efforts on Kauai and elsewhere in the state. Associated Press. Legislators proposing $100M aid package for storm-ravaged Kauai. Hawaii News Now. The state Legislature Wednesday funneled $125 million for road, bridge and other infrastructure repairs for the stricken communities in the wake of devastating flooding on Kauai. Garden Island. House and Senate conferees began negotiations on a final version of HB1900 HD1 SD1, the state budget bill. Early agreement on a number of budget items included: $7.1 million to increase payments supporting foster children and resource caregivers; $1.7 million for services at Aging and Disability Resource Centers; $3.4 million for rescue and fire fighting staff and vehicles at Lihue Airport; and $500,000 for books and materials for public libraries statewide. Maui Now. Hawaii Seems Poised To Ban Coral-Damaging Sunscreen. It would be the first state to prohibit the use of sunscreen containing ingredients that scientists say harm sea life. Civil Beat. Bill seeks to ban 2 sunscreen chemicals suspected of damaging coral. Star-Advertiser. Hawaii lawmakers are discussing versions of two bills that would tighten the state’s already strict gun regulations. Associated Press. Few Hawaii Students Have Access To After-School Meals. A new report by the Food Research & Action Center shows Hawaii near the bottom in terms of serving an after-school supper to low-income students. Civil Beat. The American Lung Association's State of the Air 2018 report shows that Hawaii continues to have some of the best air quality in the nation. KHON2. State seeking to improve how it regulates HECO. State regulators are seeking public participation in an effort to better align the interests of Hawaii’s biggest electric utility and its customers. Star-Advertiser. The U.S. Department of Transportation has fined Hawaiian Airlines $125,000 for violating the agency’s airline consumer protection rules. Star-Advertiser. Home Depot is gearing up for spring season by hiring 150 associates in Hawaii, with hiring events taking place at several of its stores across the state on Wednesday. Pacific Business News. Efforts to clean and restore damaged areas began coalescing Wednesday, with Honolulu Mayor Kirk Caldwell issuing an emergency declaration for Oahu while Gov. David Ige announced that the island was joining Kauai on his state-of-emergency proclamation. Star-Advertiser. East Honolulu residents still bogged down by mud ask: Where's the government? Hawaii News Now. Red Hill Underground Storage Fuel Tank Legislation Fails. Local efforts to mandate more timely upgrades for the Navy’s Red Hill Fuel Storage Facility on O’ahu failed in the Legislature this session. Hawaii Public Radio. 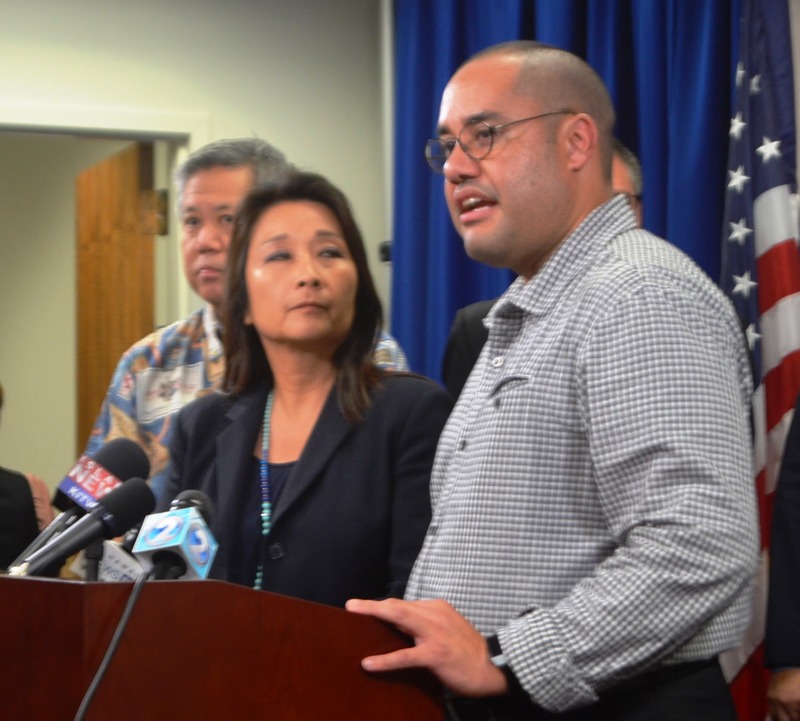 Ige announces program to divert Honolulu homeless from jail. Under a new program announced Wednesday by Gov. David Ige, homeless people who commit minor crimes could receive social services instead of going to jail. Star-Advertiser. The state Wednesday launched a collaborative pilot project called Law Enforcement Assisted Diversion, or LEAD, to help Oahu's homeless and reduce criminal activity. KITV. Waikiki lifeguards frustrated as homeless fights, obscene acts distract from job duties. Hawaii News Now. The Board of Water Supply has completed repair of the 24” water main which ruptured Tuesday near the entrance to the Waimanalo Gulch Landfill on Farrington Hwy. above Ko Olina in Leeward Oahu. This main feeds water to the entire Waianae Coast. KHON2. The state held a ceremony Wednesday for starting construction on a $7.3 million technology business incubator building in Kakaako. Star-Advertiser. Funding for the construction of a 120-bed extended-care veterans’ facility on Oahu has been accelerated due to $685 million in increased funding the U.S. Department of Veterans Affairs received from Congress for the VA State Veterans Home Construction Grant Program. Pacific Business News. Juvenile crime is down 58.5 percent over the past five years, despite heavy caseloads and limited budgets in the Office of the County Prosecutor. Crimes in other categories have also been dropping. West Hawaii Today. Planning director Micheal Yee gave the Hawaii County Council Finance Committee an overview of his department’s operations during a special budget review meeting in Hilo on Tuesday. Big Island Video News. Big Island Police and the military are investigating a reported sexual assault at the Hawaii Youth Challenge Academy in Hilo. KITV. Solar contractor sues former customer to remove blog. A Big Island solar contractor is suing a former customer, seeking a court to order the Pahoa man to remove a blog from the internet that the contractor claims was “maliciously created … with the intent to cause financial harm.” Tribune-Herald. Hawaiian Volcano Observatory is reporting that the magma system beneath Kilauea’s Puu Oo cone has become increasingly pressurized, leading scientists to believe a new vent and lava flow may be imminent. Star-Advertiser. Mayor has at least $2M in land and farm holdings. Arakawa, other county officials financial reports released. Maui News. South Maui residents object to bridge project. Residents say Kulanihakoi Bridge Replacement project won’t stop flooding, offer alternative idea. Maui News. Repairs Continue at Site of West Maui Waterline Break. Maui Now. Zuckerberg, Chan pledge $1 million. In response to severe flooding on Kauai, Priscilla Chan and Mark Zuckerberg have pledged to donate $1 million to organizations working tirelessly to assist the community’s storm relief efforts as well long-term recovery. Garden Island. Facebook founder and part-time Kauai resident Mark Zuckerberg is donating $1 million to flood relief efforts on the Garden Isle. Hawaii News Now. The Hawaii Community Foundation said it is partnering with eBay founder Pierre Omidyar, his wife Pam and two anonymous donors to establish the Kauai Relief and Recovery Fund to assist with recovery efforts from the recent floodingthat has devastated the island’s North Shore. Pacific Business News. Zuckerberg, Omidyar among donors supporting flood relief, recovery on Kauai. KHON2. Kauai Braces For More Rain: 340 Airlifted, 12 Landslides, Thousands of Pounds of Debris. Maui Now. Here’s Why The Weather Experts Didn’t See The Kauai Storm Coming. The rain-laden system was hard to track because it wasn’t large-scale, like a tropical storm. Civil Beat. Survey finds flood damage in parts of Kauai worse than formerly thought. Hawaii News Now. Relief efforts will continue for stranded residents and visitors in Haena and Wainiha on Kauai today despite a flash flood watch that is set to go into effect Thursday through Friday for the entire state. Star-Advertiser. U.S. Reps. Tulsi Gabbard and Colleen Hanabusa spoke of the destruction caused by severe flooding on Kauai and East Oahu on the House floor this morning, calling attention to victims while thanking first responders for their hard work. Star-Advertiser. The Kauai Police Department and Kauai County prosecutors said Wednesday that they were investigating multiple extortion cases involving would-be rescuers during the island’s historic rain and flood event over the weekend. Hawaii News Now. A female bison frightened by the on-going, helicopter storm relief efforts in Hanalei bolted into the ocean Wednesday and was roped and brought back to shore: First by boat, then with the help of personal watercraft and —finally — four paniolo from the bison’s Hanalei ranch who patiently nudged it out of the surf. Star-Advertiser. Reality Sets In For Kauai’s Flooded-Out Residents. Civil Beat. Hanalei Elementary School on Kauai will remain closed for all students for the rest of the week as the campus is cleaned after suffering flood damage this weekend, state Department of Education officials said Wednesday. Star-Advertiser. Lenny Rapozo, director of the county Department of Parks and Recreation, has officially filed his papers for the upcoming mayoral race. Garden Island.